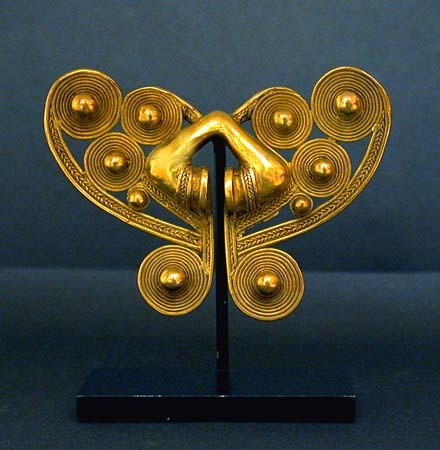 This fine gold openwork ornament, of stylized butterfly form, decorated overall in graduated spirals, the centers featuring globular beads in relief, the raised nose bridge and extremities with highly detailed herringbone banding. 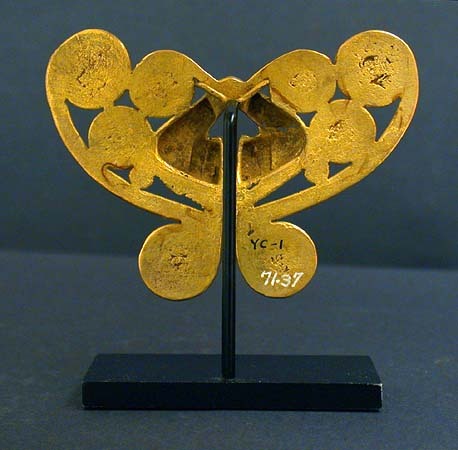 Provenance: 1) The Munson-Williams-Proctor Institute, Utica, New York, acquired in 1971. 2) André Emmerich, New York, 1968. Cf. Royal Academy of Arts, The Gold of Eldorado, London, 1978.